Cook lasagna noodles in boiling salted water for 7-9 minutes. Drain and rinse. In a saucepan, melt the butter. Gradually, stir in the cheese until smooth. Add cream. Continue heating, just to a boil. Remove from heat. Add parsley. In a skillet over medium heat, sauté onion in oil for 3-4 minutes. Add chicken and pepper to skillet and sauté until the chicken is no longer pink. Add Alfredo Sauce to skillet and cook 2-3 minutes to combine flavors and slightly thickened. Remove skillet from heat and allow to cool slightly. In a bowl, combine the ricotta, Parmesan, egg, and nutmeg. Place half of the spinach in a large dry skillet over medium heat. Cook until wilted and transfer to a clean towel to cool. Repeat with remaining spinach. Preheat oven to 350 degrees F. Lightly grease a 13 x 9-inch baking dish. Spread a thin layer of the sauce in the bottom of the dish. 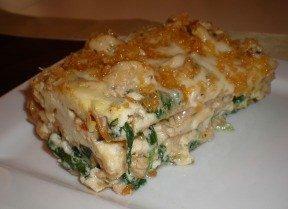 Arrange 3 lasagna noodles lengthwise over the sauce. Layer one-third each of the cheese mixture, spinach, and sauce over the noodles. Repeat layers 2 more times. Sprinkle the top with the mozzarella cheese. Cover with foil and bake for 35 minutes. Place the Panko crumbs and 3 tablespoons oil in a small skillet. Stir over medium heat until the crumbs turn golden brown. Remove from heat. Remove the foil from the lasagna and sprinkle the crumbs over the top. Bake uncovered for 10 more minutes. Let stand 10 minutes before serving. Lasagna layered with chicken, spinach, and ricotta, is baked with Alfredo Sauce and mozzarella and topped with crunchy Panko breadcrumbs. 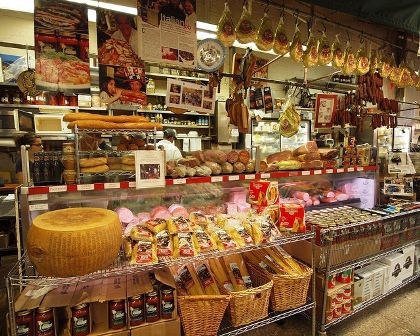 Italian recipes, while dining at an Italian restaurant, or traveling in Italy. This insulated carrier has a large main compartment and an expandable top compartment designed to accommodate most 9" x 13" baking dishes. Both compartments feature high performance insulation plus a radiant barrier to keep food hot or cold for hours. A large exterior zippered pocket can be used for carrying accessories like cutlery and napkins. Great for holidays, parties, potlucks, picnics and more. This 9" x 13" Rachael Ray Rectangular Lasanga Lover Baker is ideal for melting cheesy lasagna, roasting chicken or topping the meal off with a blueberry cobbler. Great for multiple purposes, you can also use it as a serving tray for salads or fruit. Crafted from dependable stoneware that doesn't react to food and is safe for use in the microwave, dishwasher, freezer and oven up to 500 degrees Fahrenheit. Catskill Craftsmen Reversible Perfect Pastry Board, 22" x 16" x 3/4"
Created in the USA using sustainably harvested domestic hardwood.